GKeep Panel is a free Google Keep extension for Firefox that is used to integrate Google Keep with Firefox so that you can access your Google Keep notes immediately on any web page while browsing on Firefox. Google Keep is a simple note taking service (to write and save notes) provided by Google and it comes as an attached part of Google Drive. As an extension for Firefox, GKeep Panel helps to access all the notes saved by you on Google Keep by accessing Google Keep with a single click. You don’t need to open Google Keep webpage again and again to create and save notes. GKeep Panel will provide a pop up window (or panel) for Google Keep which you can move anywhere, can resize, as well as open it with any custom hotkey. You can see GKeep Panel extension icon in above screenshot. Clicking on the icon will open Google Keep window to write notes and to read saved notes. You only need to install it with your Firefox browser. Earlier we covered Google Keep app for Chrome, and now you can use this extension to easily access Google Keep on Firefox as well. A very useful Firefox extension that allows to access Google Keep on any web page while working on Firefox. 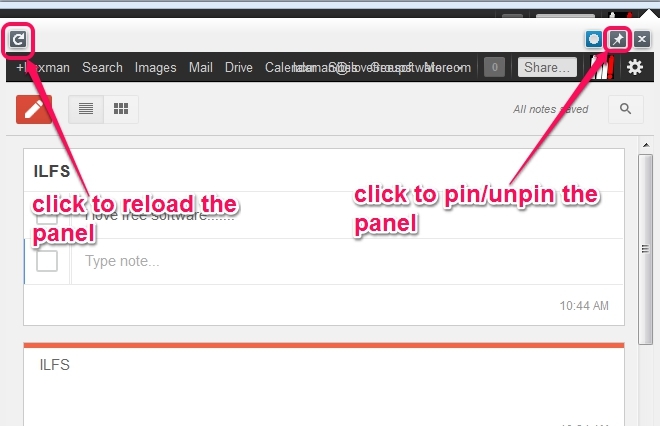 A pop up window (panel) will be opened each time you click on GKeep Panel’s extension icon. You can pin the panel to keep it on top of other tabs. You can resize the window size and can even pin it to make it remain always on top of tabs opened on Firefox. Access Add-ons Manager of Firefox and use Options button present in GKeep Panel extension to change the settings. No need to create a new account, simply logIn with your Gmail account and access your Google Keep notes. Free to use for Firefox. You can even set a custom hotkey to open panel. 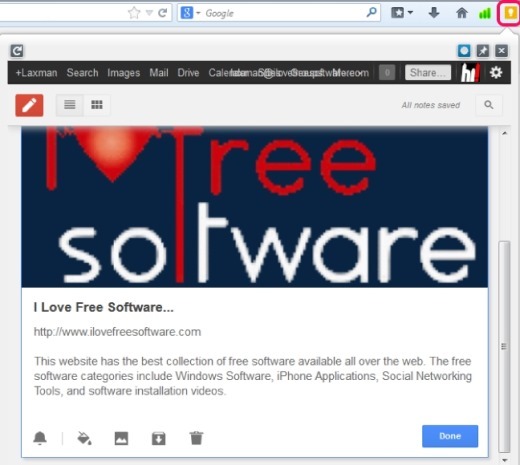 Also check these 2 Google Plus extensions for Firefox. How To Use This Free Google Keep Extension For Firefox? 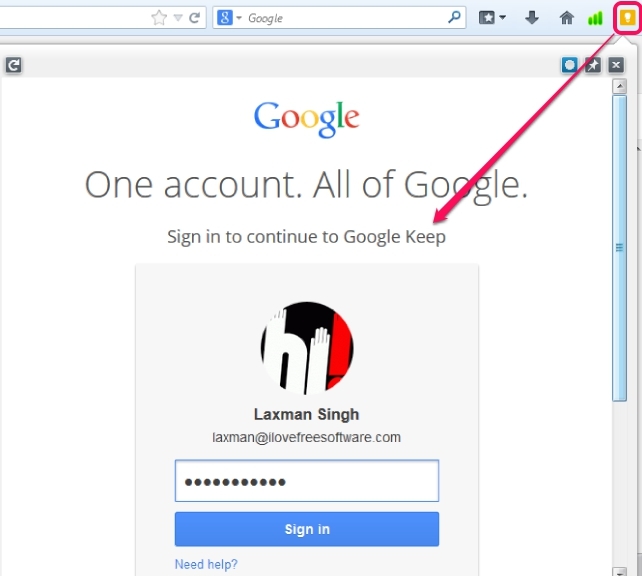 You can install GKeep Panel to your Firefox browser using the link present at the end of this article. After installing it, a browser restart is required. After this, its extension icon will be available on top right corner of your Firefox browser. Click this icon to open the panel. Now sign in with any of your Google account to access saved notes, write notes, create to-do lists, etc. You won’t find any change in Google Keep in the pop up window. All things will be the same as remains in Google Keep. You can create notes, can create to-do lists, can access Mail, Drive options, like it is possible in Google Keep. 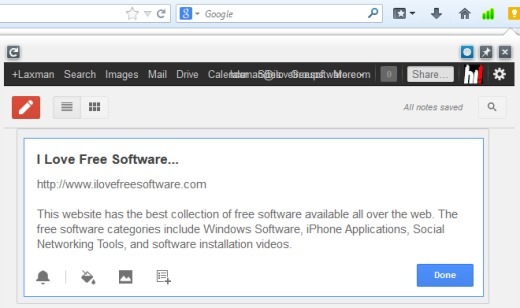 GKeep Panel is specially developed to make Google Drive accessible on any web page while browsing on Firefox. To make it more usable, you can change settings by accessing Options, can move the panel, reload the panel, and can pin the panel to make it on top of other windows. GKeep Panel is helpful whenever you need to jot something using Google Keep while working on Firefox. You can either click its extension icon or can use hotkey to open panel showing you Google Keep. Get GKeep Panel for Firefox free.